I present the first episode of my project: LEGO COMIC BOOK. I got big dilema with it. On one hand I got entire story, I would like to tell, in my head. On the other I am not sure If mange to do it - IT is so BIG WORK. So this is a try. A first short episode that took me 6 months. Before I started shoting pictures I needed to build scenography. The most important object in scenography for first episode was small space ship. I made it together with interiors. I really appriciate any comment that will help in continuing the project. I mean especially comments regarding both visual part and the story telling itself. I know the story is not revealed yet, and it is only a short fragment.On the other nad it is 34 pages and I am afraid it will be hard to read all of it. So the main question. Is it readable ? - Visually your comics is stunning. Both the quality of the photos and the editing are superb. My favourite images are mainly those in space; namely the first frame introducing the Spectre, the image of Dean and Eve out of the ship ("do you believe Amanda's words?") and the last page (with credits). But the whole comics is beautiful, and the work on the minifigs (poses, faces, etc.) is great. - The story is indeed just starting, and it's hard to judge so soon, but it's a good start. I read it all and enjoyed it. - The Comics is easy to read and understand. There are a few English/ grammar mistakes, but they don't cause any issue with understanding the story. - My only other comment would be on the amount of work it takes. 6 months for the episode 1 is a lot of time. I don't know how many episodes you plan to do, but if it's a long story i would suggest you try to think of ways to reduce the time you spend on it. Of course the great deal of work and time on it is what makes it outstanding, I only say so because it could be difficult at some point to find enough time to continue/ complete the project, and it would be a shame to have to drop it. Big projects are always the most exciting but they are also the first ones we shelf when life takes us in different directions; so i'm just talking of a way to ensure you can continue committing to it. Once again it's an amazing work you did, congrats, and I am certainly looking forward to reading the rest of the Spectre and its crew's story. -There are a few English/ grammar mistakes, but they don't cause any issue with understanding the story. Regarding English - this is not my native and I was never a good writer. I try hard to avoid mistakes. If enyone can show me mistakes in book i would appriciate this. Regarding time. I took my 6 months to complete entire episode 1. But Spectre allone took me 3 months to build. The problem is that episode 2 need mor complex scenography. Maybe I will decide to cooperate with other builders to speed up. I have to say, that I learned a lot so in some part next photo shooting should be easier. Impressive work, once I started reading I could not stop until finishing. I think is readable and apart from a few grammar mistakes, the quality is really good. So yes, I look forward to see more from this comic! I like this! Aside from the grammar and word choice issues mentioned by others, I feel like you perhaps use the "angry/intense" faces of the minifigs for too many panels in a row, which dilutes their effectiveness. A more neutral expression for most of the panels would make the times when the characters are really feeling it. Otherwise, the models are great and the framing of the panels is very good. Keep it up! Thank you. I begin to understand what I need to improve. This is very important for me. Hello. I just read your comic and I loved it. I think you put a large amount of effort in and it shows. The story is great and has everything that a sci fi story should have. I can't wait to see the next episode. I hope it doesn't take long! With that being said, some time may be able to be cut from the construction of scenes you may want to do in the future. 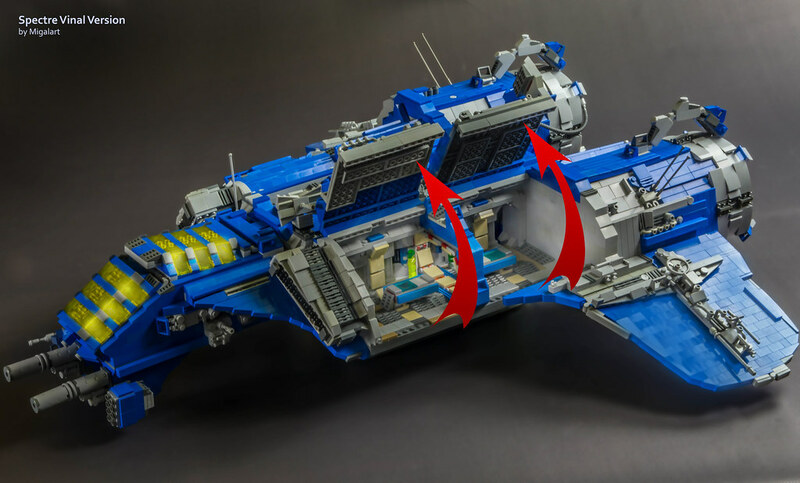 It seems that in the first episode you built the ship with the interior and made it a working model. You might save time if you just build shells of rooms or landscapes you need to take the photos then deconstruct or rearrange as needed. I do appreciate your highly detailed models though. The ship is well put together and highly detailed. Another option is doing extra ships or buildings that may only be in one scene in something like LDD. That way you don't have to buy parts and build things that don't see much screen time. I think you have a knack for storytelling and should continue with this project. Keep up the good work! Kewl, love the idea. Reminds me of the time when you'd get a little comic with some Lego. Believe it was in Pirates or Space sets, can't quite remember. - Making some seemingly insuccnificent scene's longer, such as 'the waking up procedure'. Inside shot from the pod? Some sound/myst effects when opening or something. - Small face errors; in some scene's he got black eyebrows, in the other brown. It's nitpicking... But hey, I like attention to detail. Keep up the good work, really dig your style and skills. I really like what you have done. The builds are good and so is the editing. Just the grammar makes it lose a bit of shine and the speech bubbles do get in the way a bit. Other people seemed to have mentioned good tips for builds that might help with the length of time needed. If I were to do this (hopefully one day) I would probably build a few "set" pieces like in the film industry. Good luck with the rest of the project, I hope to read more soon. You've done really well as someone who's been reading Lego comics forever, I'm truly impressed. You got the angles and photography down, and it's one of the cleanest, least cluttered comics I've seen in ages. Maybe just find an editor and you're set! I am very looking forward for more! "Kuiper Belt (...) from Earth"
"The pain in my entire body. This is unbearable." "Yes, I feel it too." "I hope, Amanda will explain us what is going on. Let's see how the others are"
"It is lonleliness. The time abyss is scary, Dean"
"I was only limited by thermal core fuel. By maintaining only critical systems, I was capable to hold for a long time. But I needed to secure some power t obe operational aften wakening you up..."
"This is not true. You are hurting me saying this." "Some time later the crew moved away the bodies of their dead friends"
"Their remains placed in two small cargo boxes." "It was Caleb who invited me to this mission." "There is nothing more we can do..."
"Do you believe Amanda's words?" "What terrifies me most is the total..."
"Anyway, I really worry about our home." Alternatively "I am really concerned about our home." "Do you have any idea where we..."
"We had a secret contact base at the Kuiper Belt"
"I calculated all. The base - if it still exists - is not..."
"I am setting the course and preparing the thermal core engine." "Lets rotate the ship to begin deceleration." "We will lose a lot of time this way." "Yes, but if they catch s on travelling speed, we have no chance to defend ourselves." "They are so fast! I can't shake them off. They shoot all the time." Instead of "Right stabilizer destroyed!" maybe the nautical term "Starboard stabilizer destroyed!" Instead of "Did you afraid of me? ": "Were you afraid of me?" "What now? Our current trajectory has been calculated." Big fan of this. I think the attention to detail and quality is just top-notch. People have pointed out the writing so that's not that big of an issue as long as you are aware. The story seems interesting enough. Let me ask you something, I've been working on my own comic book and I was curious as to how you layout your pages.